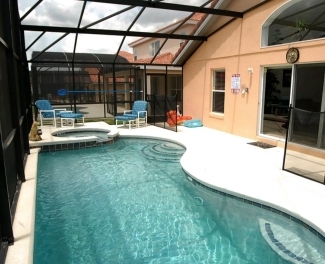 Rent this 5 star child friendly Davenport villa for that long planned family vacation. Perfectly located in the exclusive Solana resort-style gated community, our 5 bedrooms and 3 bathrooms - 2 ensuite, rental villa, in Davenport, FL, is just minutes away from the Disney World. Visit wonderful Floridian attractions such as the Magic Kingdom, Animal Kingdom, Sea World and the Universal Studios for fun-packed vacations. Believe us, you can access any of these destination including Island of Adventures, Typhoon Lagoon and Blizzard Beach in minutes. World renowned golf courses are within a 5 minute driving distance and the most popular beaches of the Atlantic Ocean and Golf of Mexico are less than an hour drive from our Davenport executive vacation villa. Relax on the patio by our own south-west facing, salt water, heated pool and spa, after a busy day at the parks. The pool area has a child safety fence and it is enclosed in a net cage to keep the insects at bay. We provide plenty of recliner chairs with ottomans, a chaise lounge, and two snack tables if breakfast or lunch by the pool is in your mood. 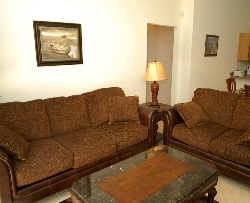 By staying in our villa you also have full access to all the amenities offered by the community club house. It boasts a huge swimming pool and a large outdoor jacuzzi, a community charcoal barbecue and a computer room with many computers. There is a nice picnic area, a playground, a soccer goal, a sand volley ball court, and small field adjacent to the club house. This Davenport villa features a living room with 32"LCD HDTV and other facilities such as DVD and CD boom-box for your entertainment. There is a game room with a professional size pool table and soft foam floors in the garage, as well as a full laundry facility. 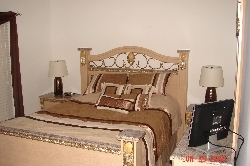 You will find two master bedrooms with luxurious beds and memory foam mattresses, and another queen bedroom with queen size memory foam mattress also. 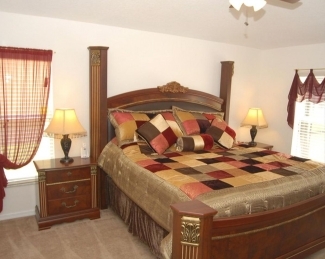 All the large bedrooms have their own flat panel HDTV and DVD, large closets, and alarm clock radios for your convenience. 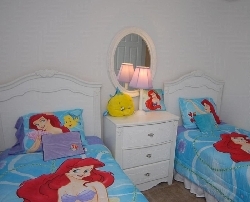 The two kids bedrooms each has two twin beds, one is decorated in the Princess Ariel style, and the other has two captain beds, and a tall night stand. These two bedrooms share the third princess bathroom. In the office/den there is a double flip-flop sofa(which sleeps 2 people comfortably), a leather storage bench, two video-rocker chairs, and a PlayStation2 video game console with 15 games, so that our guests of all ages can have a wonderful time. In the kitchen alcove there is a computer with unlimited free FIOS internet access (wired and wireless), which also has a CD/DVD drive. We offer FREE LOCAL, LONG DISTANCE, AND INTERNATIONAL CALLS TO ANYWHERE IN THE WORLD, LAND LINE OR CELL PHONE, to all our guests. 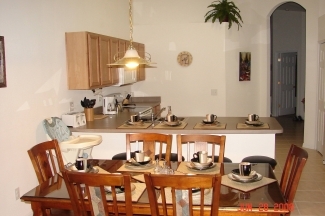 Our kitchen is fully equipped, and we also provide all the linen necessary. 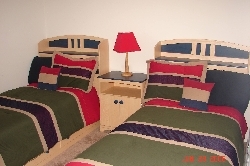 Each bed has its own 2 complete sets of sheets. White towels are provided for inside use, and pink and blue striped towels are provided for pool side use. On the side of the patio, we also have our own gas BBQ grill. For our younger guests, we have a high chair, a pack-n-play baby crib with bassinet and changing table, two strollers, and for the toddlers we have 2 toddler bed-rails which can be installed on any of the beds in the house. All our doors have child safety locks, and as by the new Florida Law, we just installed a new pool door alarm. 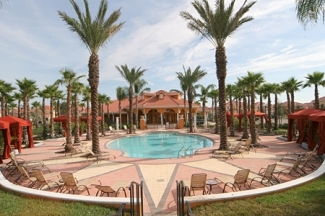 Please visit us at www.orlandovacationvilla4u.com for additional villa info and virtual tour. 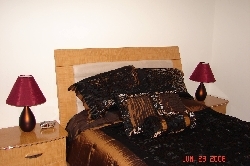 Always inquire about longer stay discounts or last minute booking specials. Advanced 2010 & 2011 bookings will receive special early booking rates, send inquiry for details. Pool and spa heat additional $30/day.